Spanish Sherry Vinegar: A staple for all great cooks! Sherry vinegar (Vinagre de Jerez) must be one of the most neglected condiments. It should really be a staple item in the kitchen cupboard. Chefs have been onto sherry vinegar for decades, but for some reason it has passed the general public by, pushed aside in the rush for “easy-drinking” balsamico style vinegars. Sherry vinegar is not “easy-drinking”; it’ is complex and intense, but works magic on many dishes and anyway, proper Gazpacho just doesn’t taste right without it. 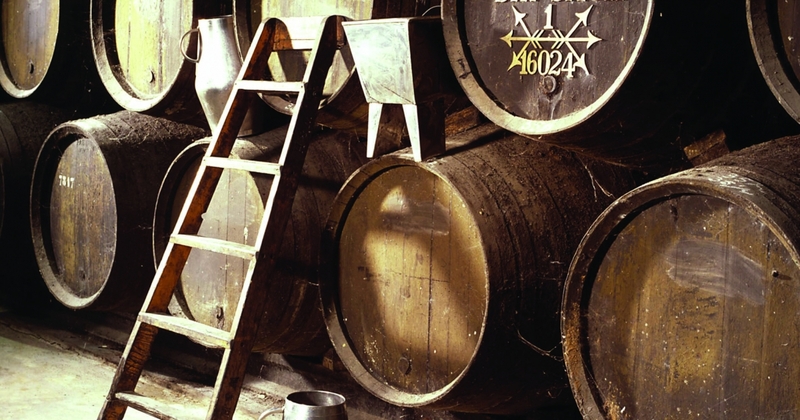 For as long as sherry wine has been made in Jerez, vinegar has been a by-product. In a sherry Bodega vinegar was seen as a failure, especially if too many of the butts turned. However from about the 1950s things started to change and most people I speak to around here agree that Pilar Aranda, owner of the Almacenista Fermin Aranda, was the first person to recognize sherry vinegar as a product in its own right and she started “looking after” her vinegars, ageing them in a solera system, just like her sherry wines. Sherry vinegar is now even protected and is one of only three vinegars in the word with Denomination of Origin. More recently the Fermin Aranda business, with its fantastic vinegar soleras, was bought by the bullfighter Alvaro Domecq, along with his family. The Consejo Regulador, who regulate production, currently use the Alvaro Domecq Reserva vinegar as their house vinegar, so it is obviously still very good! With advances in science sherry vinegar, it is no longer a mysterious and spontaneous occurrence and now the best vinegars are deliberately made, often by topping up butts already containing vinegar with sherry. The alcohol quietly converts into acid, which can take months, even years, in the cool bodegas. Some cheaper sherry vinegars are manufactured in large volumes, however even these vinegars require a minimum of six months in wood. The effect of long aging on sherry vinegars is very apparent, they become very dark through oxidisation, developing intense and complex flavours. Surprising flavours develop over time, from fruity, banana skin right through to burnt, toasted and coffee, always with a woody and nutty backdrop. The Consejo Regulador has an age grading system: Vinegars with between 6 months and two years in wood are “Vinagre de Jerez”, those with more than two years but fewer than 10 are “Reservas” and anything with more than ten years in wood is a “Gran Reserva”. I personally think it’s pity they don’t put the approximate age of the vinegar on the label, the price of an 11 year old vinegar will be very different from a 50 year old vinegar even though they are both “Gran Reservas”, and there is at least one vinegar bodega I know of, Vinagres de Yema, who sell the 50-year-old stuff – in beautiful glass bottles. It’s not cheap, but if you taste a drop the flavour evolves in your mouth for hours afterwards. Sherry vinegars are run through a solera system, the same way as the wines and the brandies and this irons out annual variations, but is also used to increase quality. Sherry vinegars are intense in flavor, but not only that, they are much stronger in acid than most other condiment vinegars. The degree of acidity (% acetic acid per volume) starts at 6 degrees (legal minimum) and I have tasted vinegars with 10 degrees. Normally a 10 degree vinegar is quite hard work straight-up in a sherry copita (which is how I think they should be evaluated), but I have had very old sherry vinegars which are so well integrated that their 10 degrees seems almost mellow. 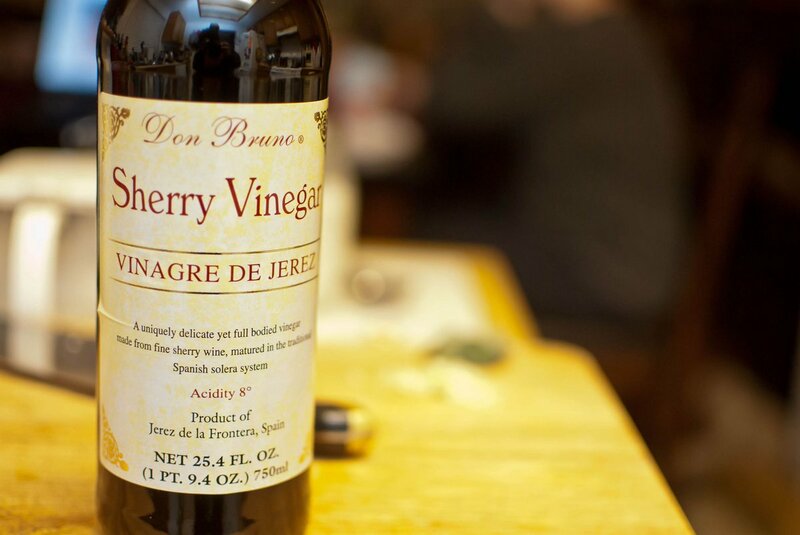 Always check the label for degrees of acidity before using a sherry vinegar. Six is low and 10 is high. You might need only a few drops of the stronger, older Sherry Vinegars to perfume a dish of grilled fish, for example, just before serving. As I mentioned right at the beginning. Gazpacho made with vinegar other than sherry vinegar just doesn’t taste right. 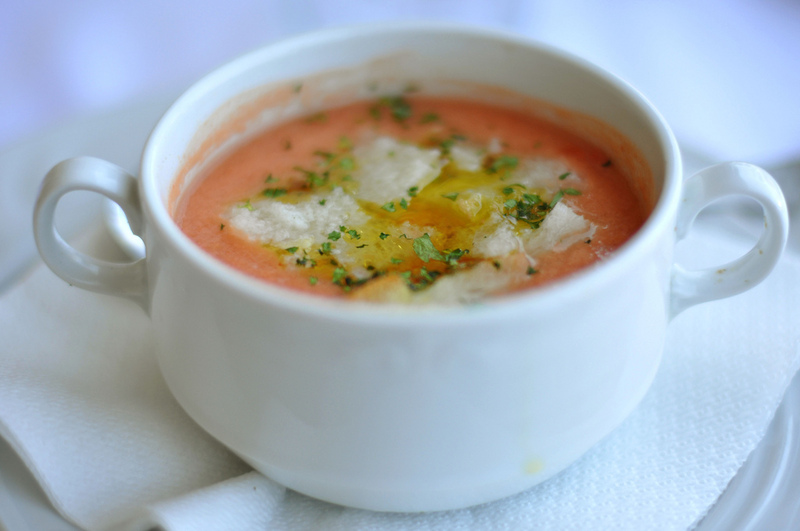 In Spain, there are are as many recipes for Gazpacho as there are cooks, but I think Manuel Valencia’s recipe is probably as close as you can get to something authentic. For me (many French chefs agree), there is nothing better than a vinaigrette made with sherry vinegar: 1 third sherry vinegar, 2 thirds oil (more old if the vinegar is a strong one), sugar or honey, salt, pepper, and a bit of dijon mustard. Shake up until emulsified. A tiny bit of crushed garlic is always an option. Should you want an Andalucia Food and Wine Tour featuring Sherry Vinegar, an Andalucian Gourmet Waking Tour not to mention a fantastic Andalucian Cooking Course, we’d love to host you!